Who isn't looking for new ways to make healthier meals without compromising on taste? 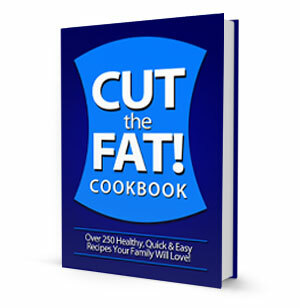 If that describes you, check out the cookbook Cut the Fat!, which delivers more than 250 recipes that help you reduce fat content while maintaining all the flavor you love. Wouldn't you like to try Chicken Cordon Bleu Rolls, Whiskey-Basted Asian Ribs, Firecracker Salmon with Mango Salsa and Peppercorn Filet Mignon with Sauteed Mushrooms? Fresh, healthy meals have never been easier to make!